The first time I saw a Solid-Neck Weissenborn was in Tom Noe's wonderful book. These guitars are the rarest of the rare – even more so than the Teardrops, which now number in the high teens. And were the original top of the line model prior to the factory in 1923. So when Tom sent me this incredible picture, courtesy of Dave Ogden, with Mrs. Weissenborn playing one of the Solid-Neck Hawaiians, it gave a rare insight into Weissenborn's early years - circa 1922. It is now well established that when Hermann C. Weissenborn began crafting his famous Hawaiian steel guitars, he borrowed heavily from Chris J. Knutsen. Several very thin Weissenborn steel guitars exhibiting Knutsen’s distinct features, such as headstock and bridge shapes, as well as the use of a green dressmaker’s seam tape to join back plates, have now surfaced. Knutsen built teardrop-shaped steel guitars and ones with solid necks as early as 1909-1912, as evidenced in Isami Uchizaki’s Tony Ku Collection. While Weissenborn waited until late in his career to build nearly identical teardrop-shaped guitars, he built several steel guitars with solid necks during his experimental years of 1916-1922. It appears the earlier solid-neck instruments prior to about 1920 were fairly thin, like their hollow-neck counterparts. They have only a 2.5-inch body depth, are smaller overall but still have a 25-inch scale length, and have the Knutsen-type bow-tie bridges. After about 1920, they were built with a 3.5-inch body depth and nearly production type bat-wing bridges. All are Koa wood throughout We can find no evidence showing production after 1922 since none of those in existence have the burned-in brand, but rather have the Weissenborn picture label. And so the solid-neck Weissenborns are extremely rare. In fact, only six are presently known to exist, and one of those came to light just recently. 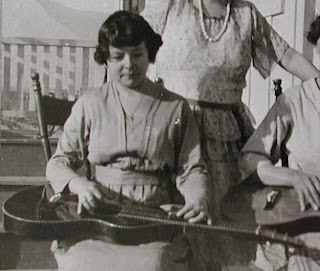 In addition, a photograph of Mrs. Weissenborn playing a solid-neck Weissenborn was recently discovered by Dave Ogden of Clear Creek Recording. While all of the existing solid-neck Weissenborns have Style 4 appointments, the one Mrs. Weissenborn is playing, the whereabouts of which is unknown, has Style 3 appointments (rope binding around the top only).